Of all the choices children participate in, Read to Someone is often their favorite. Reading with someone helps readers, especially developing readers, increase areas of comprehension, accuracy, fluency, and prosody. It also increases reading involvement, attention, and collaboration. What's more, children love partner reading and readily participate with books they choose. Children LOVE to Read to Someone, and why not, they have a friend with them who will listen to them and discuss their reading. Of all The Daily 5, teachers may be more apprehensive of this Daily 5 than any of the others, not because they don't see the value in it, but because...it can be noisy. Not to worry, we have ideas here that will contribute to engaged readers and enable you to enjoy this time as well. These foundation lessons provide students with prerequisite skills and knowledge so that the Read to Someone launch goes smoothly and successfully. Select a topic below to browse supportive resources. Partnerships can be formed in several ways. Whatever method we use, we expect students to work together respectfully, cooperatively, and joyfully. Besides reading, students have the important task of thinking about their reading. This strategy helps them do just that, and builds comprehension, listening, and communication skills as well. 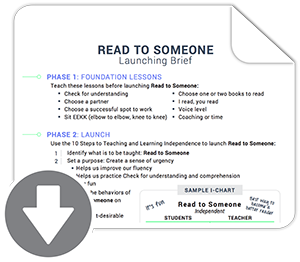 This one-page guide will help you remember what foundation lessons to teach before launching Read to Someone and what essential behaviors need to be placed on the I-chart.